Signature Smile Studio is a passionate and professional Frankston-based dental clinic that offers a wide range of high-quality services, from regular check-ups through to cosmetic porcelain crowns. Focusing on the needs of our patients, we can help you reach your goals in terms of oral health, hygiene and appearance. As a dentist Frankston locals call on for quality dental care, we proudly offer restorative, general and cosmetic dentistry to suit your needs, including porcelain crowns and cosmetic dental veneers in Melbourne. Whether your teeth are stained and discoloured, crooked, or structurally weak, our dentists can provide a porcelain tooth crown or veneer solution that helps to improve the look of your smile and give your confidence a boost. Make an appointment with our cosmetic dentist today to find out whether crowns or veneers may be a suitable option for you. As important as the health and hygiene of your teeth is, Signature Smile Studio understands that how you feel about your teeth is just as important. Helping you to feel more confident and show off the smile you’ve always wanted, we offer cosmetic dental crowns in Melbourne in addition to cosmetic dental veneers in Melbourne. 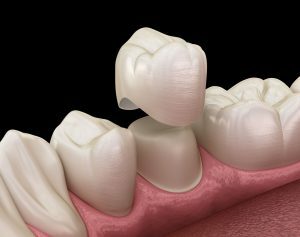 If you need a crown cap tooth treatment or you’re unhappy with the current appearance of your teeth, our dentists can assess your teeth and come up with a plan that’s tailored to address your specific concerns. Our dental caps and porcelain crowns are a popular choice for anybody looking to instantly fix discolouration, uneven teeth or unsightly gaps. Getting fitted with a porcelain tooth crown or cosmetic dentistry veneers can help you feel amazing, look amazing and mask the appearance of any past decay or crooked teeth. We also offer dental crowns for front teeth to help you achieve your dream smile. Make a positive change for your teeth today by contacting the team at Signature Smile Studio. To book an appointment for porcelain crowns or cosmetic dental veneers in Melbourne, call our dental clinic now on (03) 9783 2747 or send us a message online.